This Myrtle Beach SC condo has awesome beachfront views of the Atlantic ocean. This 1 BR/1BA is in one of the newest oceanfront resorts in Myrtle Beach, construction was completed in 2006. This VRBO home is located on 20th floor with a covered parking garage. The modern kitchen has been recently updated with granite counter-tops and is fully equipped with extra appliances, blender, coffee pot, toaster, etc. The redecorated living room includes a queen size sleeper-sofa, a pull-down murphy bed, a single-size sofa, table with four chairs, Flat Screen High Definition TV and hi speed wireless internet service. The condo is equipped linen and towels for 8. The private balcony overlooking the beach includes a table with 2 chairs and an incredible view, deal for watching dolphin play as you have your morning coffee. Community Amenities include an indoor heated pool, Olympic outdoor pool, a lazy river, kids pool, fitness center and a hot tub for relaxing in the evenings. Enjoy oceanfront dining and tiki bar with seasonal pool parties (summer), and sun deck surrounded by tropical landscaping. Paradise Resort is directly south of the downtown Myrtle Beach, has become a a popular beach destination - plan your escape today, come enjoy the best in coastal living. 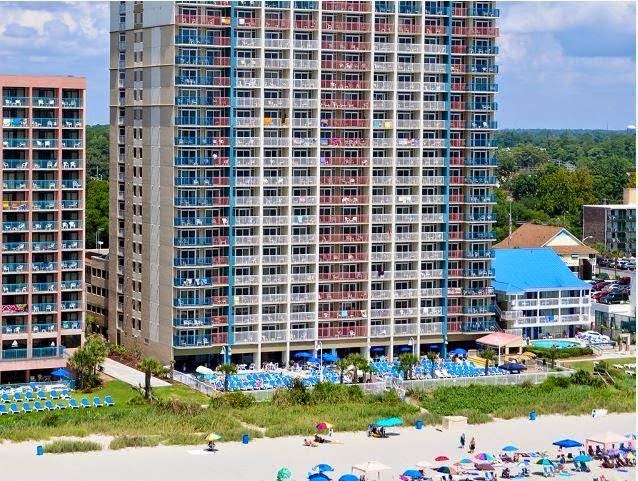 Myrtle Beach Vacation Rentals By Owner, Attractions, Photos, Reviews, etc. Myrtle Beach is a popular tourist destination on the South Atlantic coast of South Carolina; the area is known for its open beaches, variety of challenging golf links, excellent seafood cuisine, and outlet-mall shopping. The Myrtle Beach area attracts 14+ million visitors yearly, consisting of tourists from other Southern states or "Snowbirds" from the North, many whom own a condominium or timeshare along the coast.